Sonoma Valley is known around the world for its spectacular views. 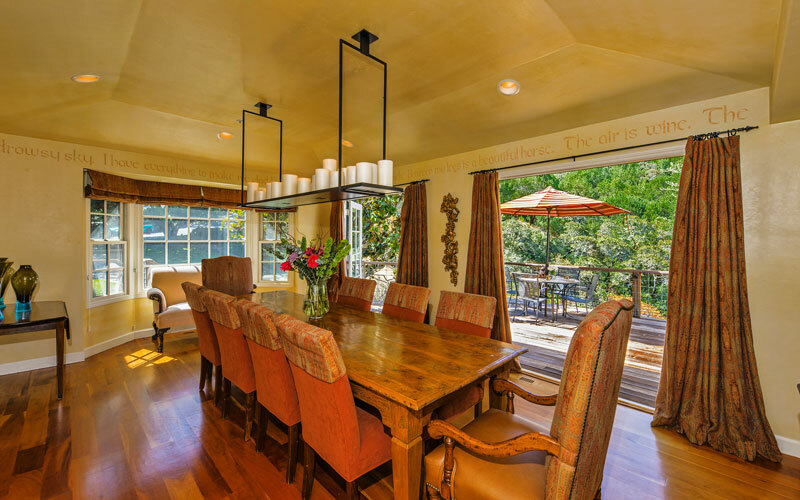 The Country House showcases views unlike any property in Sonoma Valley. 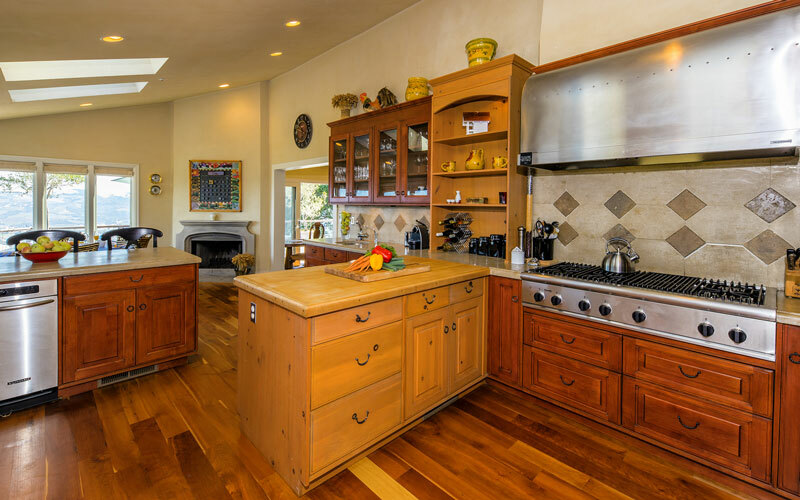 Seated high atop Sonoma Mountain, this three bedroom, three bath home is the ultimate escape. 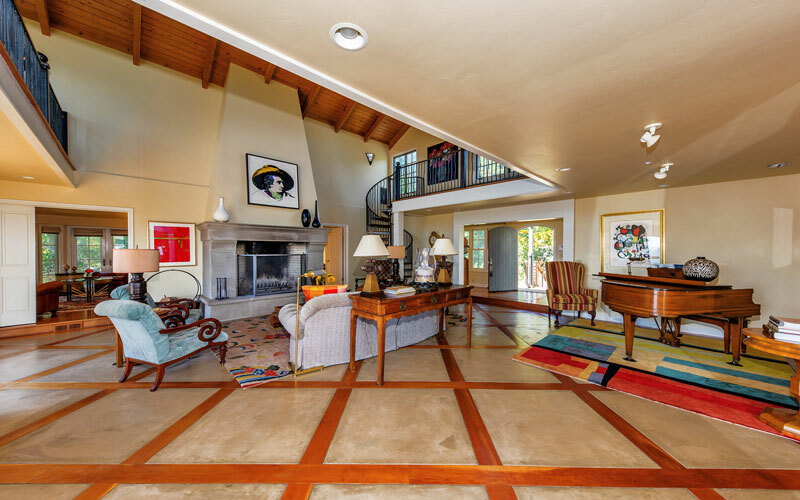 Upon entry to the home you are greeted by the Great Room which has a massive fireplace, grand piano, vaulted ceilings and luxurious décor. There are wall to wall sliding glass doors that open onto to a deck that is the perfect place to enjoy a glass of wine on summer evenings, have a relaxing breakfast in wine country and plenty of space for lounging on a chaise with a good book. Here we find breathtaking views of sprawling vineyards and the mountains. The home has numerous outdoor dining spaces. 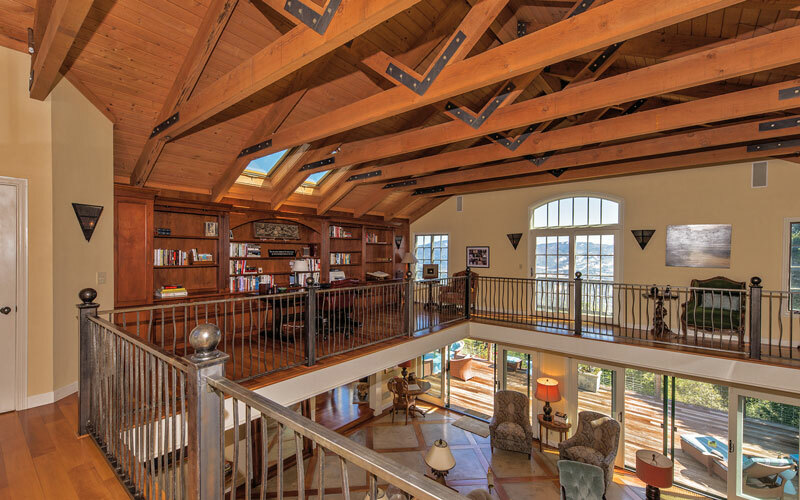 Above the Great Room you will find a lofted library and office. There is a television room with leather couch, chairs and rich fabrics to cozy up and watch your favorite show. The couch also pulls out to offer another bed. 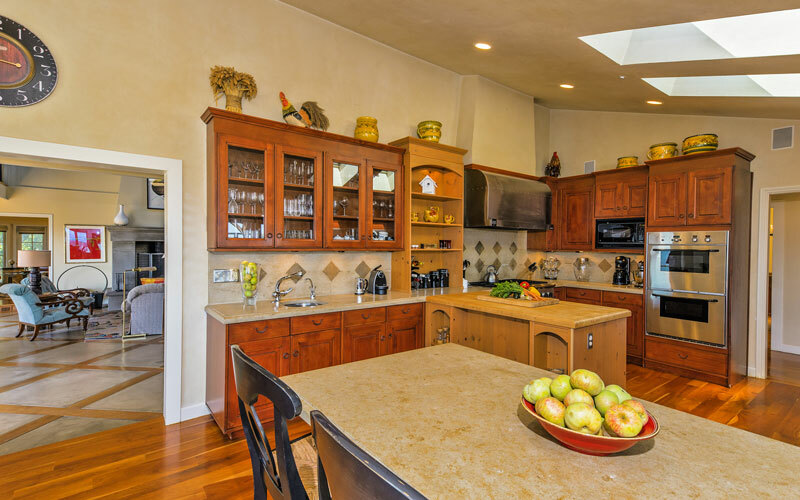 The kitchen comes fully equipped with all the essentials for preparing any meal, including ample prep space, a professional range and side by side refrigerator and freezer. At its end is a table area with spectacular views. A lovely contemplative spot where you may enjoy your morning coffee any time of year. There is a lovely formal dining room which seats 10. There are two sets of French doors that open up onto a patio overlooking a small canyon. 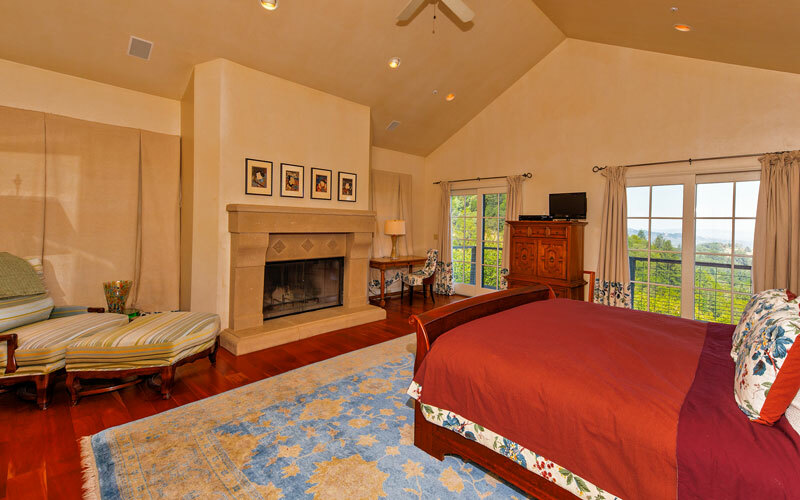 The massive master suite has a regal fireplace and a king size bed. The master bath features a jacuzzi tub, a spacious double shower with bench seating and restroom with bidet. The bathtub looks over the sweeping views of the valley below, making a soak in this tub an absolute luxury. The second bedroom features a queen sized bed and French doors that open to one of the quiet outdoor patio spaces. The third bedroom is detached and offers a queen sized bed, full bath, kitchenette and treadmill. From the back deck you descend down a set of stairs and you will find another sitting area with a fire pit and lounging chairs. A few steps further leads you to the hot tub on a small deck, perched out on the tip of the hill so as to best capture the phenomenal view while relaxing in the spa. Wrap around the other side of the hill and you will find the absolutely gorgeous pool area. The large square shaped pool has a small waterfall that cascades down from the dining area, seated below a pergola that provides beautifully filtered light. Here the patio has large couches and chairs, a dining table and a built in outdoor kitchen. Dogs are allowed, but must be pre-approved. 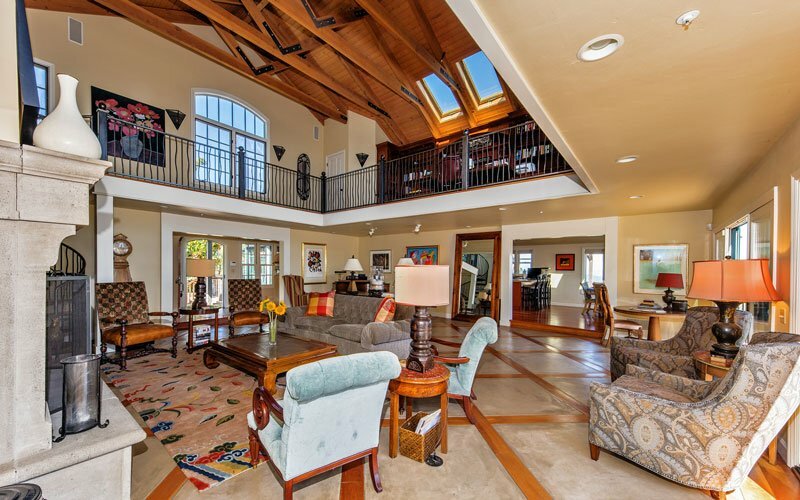 This home is one of a kind and will not disappoint. If you are looking for an escape in the wine country, look no further, The Country House has it all. Please be aware that this home is seated at the top of the mountain and the one lane road winds around and can be quite steep in places. It is very rural and is not a location that limos, wine busses or taxi/ubers would want to go. 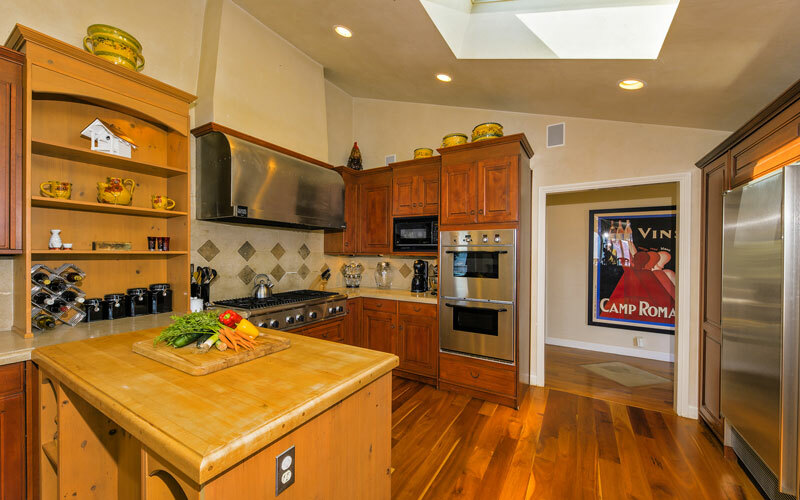 It is very much a country home, and if staying high above Sonoma in the absolute peace and quiet of nature suits you, this is the home for you. So come to The Country House and wine, dine and recline.